Alan Furst is a magnificent teller of tales. But his tales are so intricately woven, finely detailed and endlessly researched that they are occasionally very difficult to read. Not difficult in the way we might read Beowulf in its arcane tongue, but in the sense that the reader had better stay awake, alert and observant. Keeping a log of all character names and their roles and allegiances is helpful, for they show up hundreds of pages later, and in other books in the series. 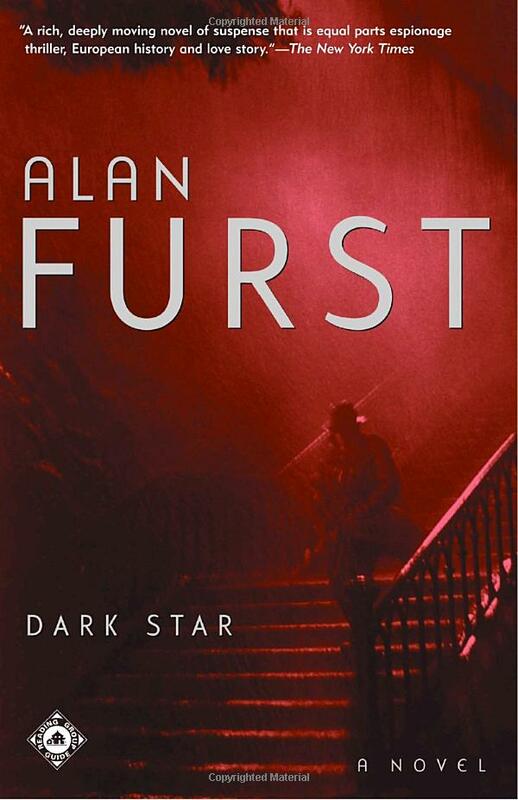 Furst’s early books in the Night Soldiers series, Dark Star being the second, are described as a collection of novellas. According to Furst, that format is among the most sublime in literature. I must also join the chorus of those who place these Furst books firmly in the literature category. They are far more than merely spy novels, though they certainly are. Inspired by the likes of Eric Ambler (Furst wrote the first page of Night Soldiers in the back page of his copy of Ambler’s Coffin for Dimitrios), Furst joins him as a genre luminary. Dark Star, in particular, is very long, and its length works against it. Even the author regards this one as too hefty, a “doorstop,” because he made assumptions about novels and lengths that he’s not happy with. However, this should not deter the reader from embarking with the unlikely hero, Andre Szara, into a web of obscure allegiances and shifting political threats. The tale is sweeping and wonderfully rich. We travel across pre-war Europe, visit the countryside and the seedy underbelly, and trust no one. We enjoy the hearty food in Parisian Brasseries, mingle with the exceedingly ostentatious upper-crust of society, hang out with bent-nosed crooks, and tremble before gun-wielding operatives in felt hats. We are taken from the highs of professional success to the lowest despondency of a nameless man who knows he’s about to disappear in some tiled basement. The span of circumstances is dizzying. More than merely a spy novel, it is experiential history – as if we are there with the smells, sounds and view. Szara is not merely a character, but a human into who’s psyche we are thrust, sometimes with compassion, sometimes contempt, sometimes with the hope and empathy of a dear friend. Through him, we experience the prelude to war and the German invasion of Poland as the average Joe, or Jacques, or Josef. Leaving out plot spoilers, the reader brushes up with all manner of intelligence goons, the political apparat, officers of varied nations, show girls, old men in coveralls, and even the Georgian kvohst. We even unravel the mind of one of history’s darkest souls, little Soso, Josef Stalin, who’s love affair with another gutter-rat-become-tyrant is unfolded with unexpected elegance. Its a history lesson wrapped in a man’s life, lived seat-of-the-pants style. Loves come, they go, they are lost, they persist. We travel Europe on over-loaded tramp freighters, bounce in Pobedas as they rattle down country roads, and look out the window at shady figures from luxury rail cars halted in cold, ominous nights. The book is a fantastic tour of real history as seen from the ground. That said, its length and density of detail – all vital to the plot – are not best tackled by sleepy readers or those with wandering thoughts and buzzing smartphones. Difficulty comes to those who do not devote themselves to loving the labor of careful reading, and for that, I had to re-read the first half of the book. Likewise, I lost the plot in the fourth novella – my own negligence again. Perseverance prevailed and I’m glad for such grace. But do keep the pen and paper handy. I like note cards to help as references in such reading feats. Having read the inaugural book in the eponymous Night Soldiers series, along with this second substantial work, I now turn my attention to Furst’s personal favorite of the series, the considerably less dense The Polish Officer. I am currently plowing through it with great speed. Furst loved it; I’m seeing why..